How the Philippines Got Their Name? The Philippines is an archipelago of islands located in the western Pacific Ocean. She sits on the eastern Asian border between the Philippine Sea and South China Sea. Her neighbors are Taiwan and China to the north, Vietnam to the west and Indonesia to the south. It is made up of 7,641 islands that have three main geographical divisions, from north to south, Luzon, Visayas and Mindanao. The capital city is Manila but the most populous city is Quezon City. Both cities are part of Metro Manila. Metro Manila is the considered to be the most densely populated area of the world, with 55,446 people per square mile. Every ten years the Philippines experiences a large magnitude earthquake and in 1991, Mt. Pinatubo erupted, creating the largest mushroom cloud the world has seen. Its eruption ejected ten billion metric tons of magma and 20 million tons of sulfur dioxides into the stratosphere. Today the Philippines is an archipelago but it is believed that during the Ice Age, they were connected to mainland Asia by a land bridge, allowing humans to walk from there to Asia. The earliest people were hunter-gatherers. Somewhere between 3000 and 2000 BC, people learned to farm. They grew rice and had domesticated animals. They traded with China from the 10th century on, and by the 12th century, Arab merchants arrived and introduced Islam. In 1521 Magellan discovered the Philippines and claimed them for Spain. The conquistadors and friars converted the Filipinos to Catholicism. They built schools and universities and created a feudal system. In 1762 the British captured the Philippines for a brief two year period. In the 19th century a nationalist feeling was starting to grow, influenced by a writer named Jose Rizal (a national hero). In 1898 a war broke out between the USA and Spain. The Americans defeated the Spanish fleet in Manila Bay. Despite trying to become independent, the Philippines were handed over to the Americans as part of a peace treaty. Another war broke out between the Filipinos and American forces in 1899 and lasted until 1902 when the Filipino leader Aguinaldo was captured. The USA wanted to Americanize the Philippines but never quite succeeded. The USA promised the Philippines their full independence by 1945. In 1941 Japanese troops invaded the islands and by May of 1942, the Philippines were entirely in the hands of the Japanese. In October 1944 American troops returned to the Philippines and recaptured Manila in February 1945. The Philippines became independent on July 4, 1946. Manual Roxas was the first President. In 1965, Ferdinand Marcos was elected president and was reelected in 1969 however, extreme poverty and inequality created a Communist insurgency in the countryside. Marcos declared martial law in 1972 and his dictatorship was exceedingly corrupt. He was forced into exile in the late 1980s. You may recall the discovery of thousands of pairs of shoes that his wife Imelda, left behind when they fled to Hawaii. Today there is museum housing over 800 pairs of her shoes. After Ferdinand’s death, Imelda returned to make two unsuccessful bids for the presidency. Today the Philippines is still poor but things are getting much better. They have a population of 103 million people and a growing economy. There are an estimated 175 languages spoken in the Philippines. Most of them are classified as Malayo-Polynesian. Among them there are 13 indigenous languages, spoken by nearly one million people. Today the official languages are Filipino, (also known as Tagalog) and English. Spanish was spoken by 60% of the population in the early 20th century. The Philippines has a fusion culture where east meets west. Despite the western influences, the old Asian culture of Filipinos has been retained and is clearly displayed in their daily lives. It unfolds in their music, dance and literature. 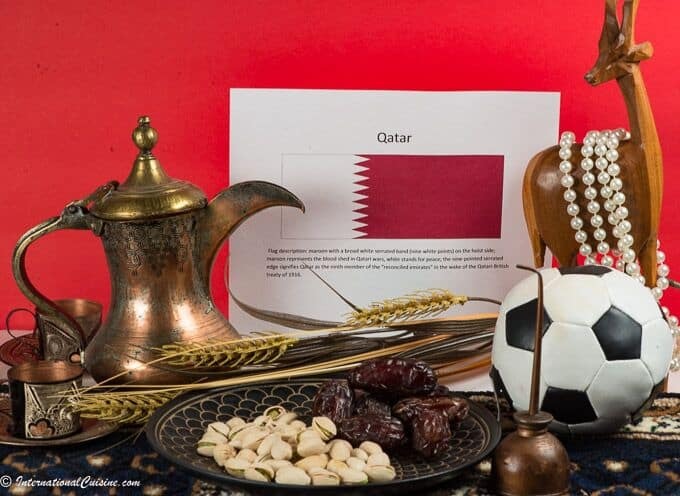 Their culture embodies what is known as “bahala na”, a general sense of “whatever will be, will be.” Christianity is very important and practiced by about 80 percent of the population, while Islam is the religion of about 11 percent. Christmas is one the most loved celebrations of the Filipinos. 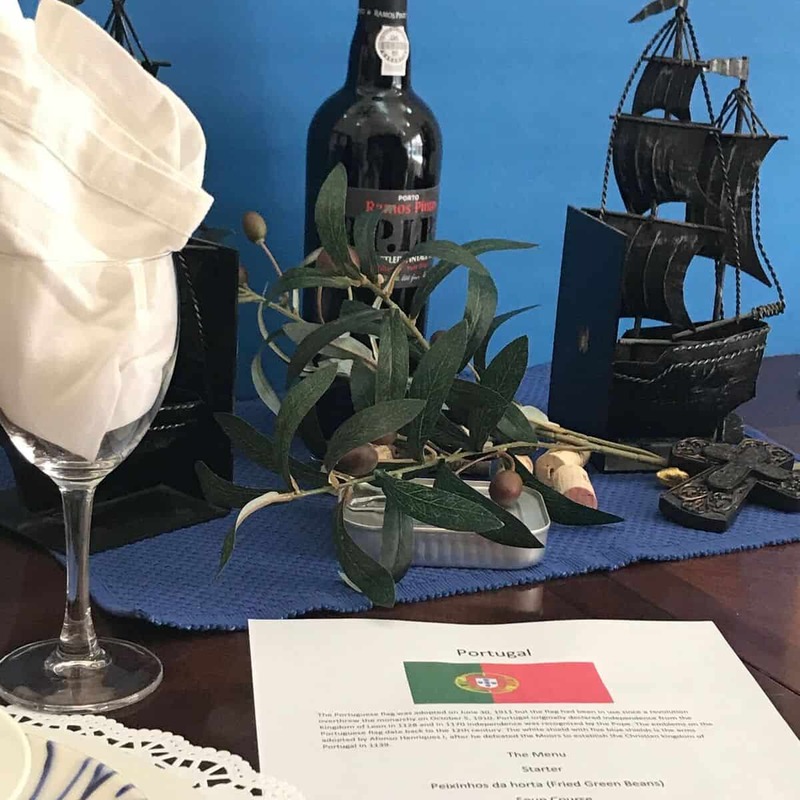 Families and friends gather on the 24th of December for “Noche Buena”, a Spanish term which means “Midnight Meal” to welcome in Christmas Day. New Years is another much loved holiday when they wear dotted clothes and prepare round fruits on the table to symbolize prosperity. Their annual calendar is filled with festivals, many of which include costumes and rituals from the nation’s pre-colonial past. Filipinos love sports and enjoy watching and playing games like basketball and American football, as well as boxing. There national sport is called arnis, a form of marital arts. The basic social unit of the country is family. The family unit includes aunts, uncles, grandparents, cousins and other outside relations, such as god parents and close friends. This results in massive gatherings, filled with music, singing, food and laughter. The Filipinos are known throughout the world to be a friendly, happy and a fun group of people. They are also amazing caretakers. Many have trained to become nurses and have moved to the USA to send money home to their families. They are known as “Overseas Filipinos”, with over three million in the USA and over a million in Saudi Arabia. They love to shop and the Philippines is home to three of the world’s largest malls. The mall is also a good place to escape the heat and humidity of their tropical climate. The Philippines has a diverse climate but suffers from torrential rains during the Monsoon Season, which can also bring about deadly typhoons. The first reason to visit the Philippines would be to enjoy the Filipino people, known to be some of the friendliest in the world. Second, would be the stunning beauty of their over 7000 islands; immaculate white sandy beaches and pristine turquoise waters. Every conceivable water sport is practiced in the Philippines. The Tubbataha Reefs are a UNESCO world heritage site and some say it is the best diving site in the world. There is an underground river in Puerto Princesa, Palawan, where you can take an hour long paddleboat tour through the cave and see one of the Seven Wonders of the World. On the island of Bohol you will find the 1260 hills that look like chocolates and may also see tarsiers, one of the cutest and smallest monkeys in the world. Siargao Island is known as the surfing capital of the Philippines. In Sagada, a mountain province, you can find hanging coffins in Echo Valley, where the locals believe the dead should be placed in steep crevices so they can be closer to the gods as they journey to the afterlife. The Batad Rice Terraces are a site to behold but getting to them is not all that easy. The rice terraces are also a UNESCO site. Vigan, on Llocos Sur, is a whole town (and another UNESCO site) known for an exceptionally well-preserved 16th century trading town. The list of incredible destinations goes on and on, but I did I mention the food? Filipino food is often referred to as the original fusion cuisine. Hints of Spanish, Western, Chinese, Japanese and Pacific Islander flavors, are all a testament to its rich cultural heritage. But it should be noted that they have flavors all of their own, that are quickly becoming world renown. They are specifically known for the acids and sweetness that many of their dishes impart. 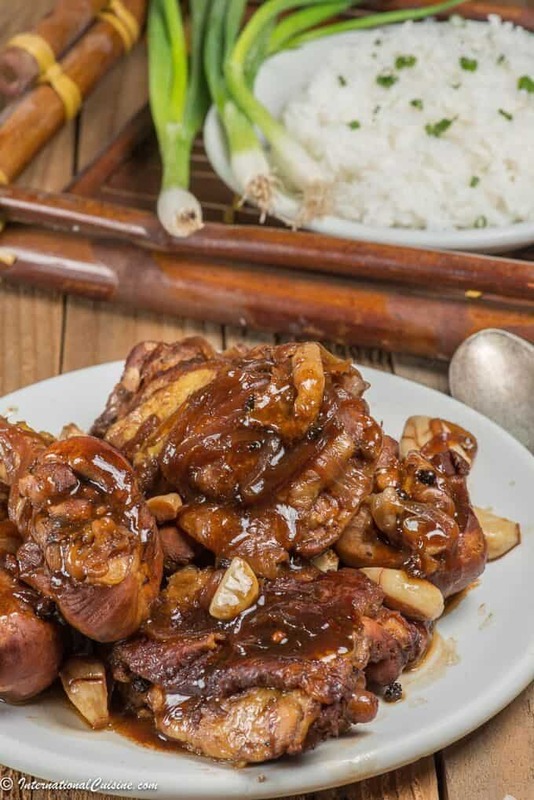 Adobo, for example, means “marinade” and whether it is for chicken or pork, it is considered the national dish. The meat is drenched in a mixture of soy and vinegar and just might be the best you have ever tasted. Pork is the meat of choice in the Philippines, with dishes like the famous lechon that is famous for the crunchy exterior of a whole, spit roasted pig, dipped in lechon sauce which consists of vinegar, sugar and a touch of liver. Even the late, cuisine adventurer, Anthony Bourdain, considered it the best he had ever tasted. Also the delicious pork longganisa, is a sausage made with ground pork. Lumpia is a spring roll and ubiquitous there as an appetizer or snack. They are served fried or fresh and stuffed with vegetables and sometimes minced meats that will make your palate sing. Fresh seafood is abundant there, as are tropical fruits of every variety. The Philippines are the largest exporters of coconuts, papayas and mangosteen. Bangus is considered to be the national fish, also known as milkfish. Mango salads are topped with tart calamansi juice, similar to a lime or lemon. Mangoes are the national fruit and are known to be the sweetest, most delicious, mangoes in the world. Bagoong is a fermented fish sauce that imparts its umami flavor to many dishes and is native to the Philippines. Sinigang is a delicate soup that is made with fish, seafood or meats, cooked in a sour tamarind broth, with fresh greens. Ube is a purple yam and is officially a craze on social media platforms with its health benefits and beautiful lavender color. 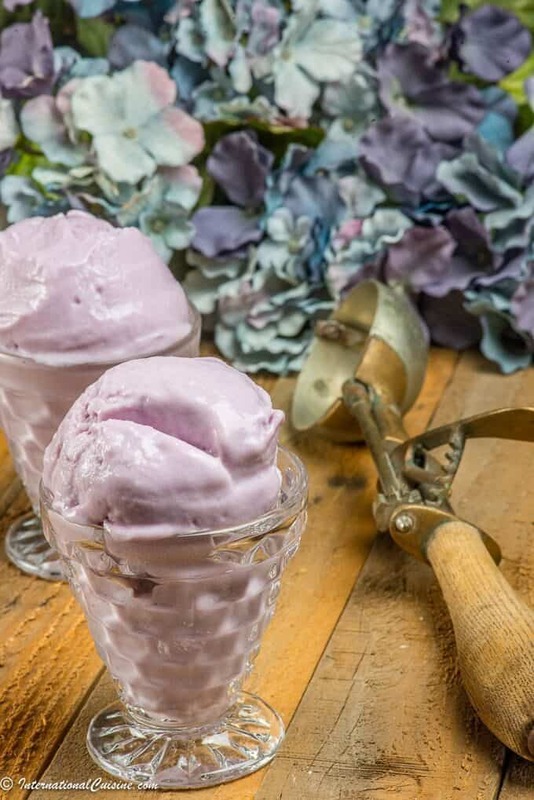 Ube is often used to make ice cream and for their beloved halo-halo dessert but is also enjoyed boiled and baked. One of the most interesting and traditional dishes is balut, which is a boiled, fertilized duck egg with a half-formed chick inside. It is believed to be an aphrodisiac. Needless to say there are so many delicious and unique choices to try and enjoy in the beautiful Philippines. We set the scene with the colors of the flag: red, white and blue. 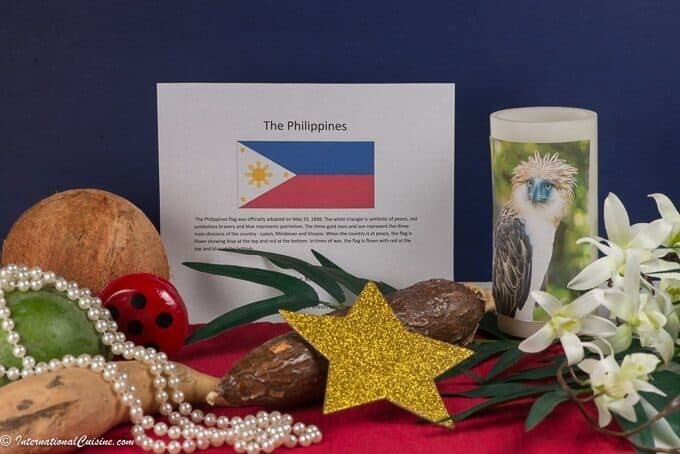 We placed mangoes on our table and a picture of a Philippine, an eagle with the same name (Their national symbol and the largest eagle in the world.) A string of pearls was added, as it is the national gem and where the largest pearl ever was discovered, weighing a whopping 14 lbs. Palm fronds were used, as Anahaw leaves are used as a roofing material on the humble abodes called, bahay kubo or nipa huts, that still dot the rural country sides. A yo-yo was included because it was invented by a Filipino and means “comeback” in the Llocono language. Lastly, white flowers topped off the décor, representing the national flower, called Sampaguita, also known as the Arabian Jasmine. Its aroma is simply intoxicating. We began with the famous lumpia (spring roll) and I chose the fresh variety. We absolutely adored this appetizer. 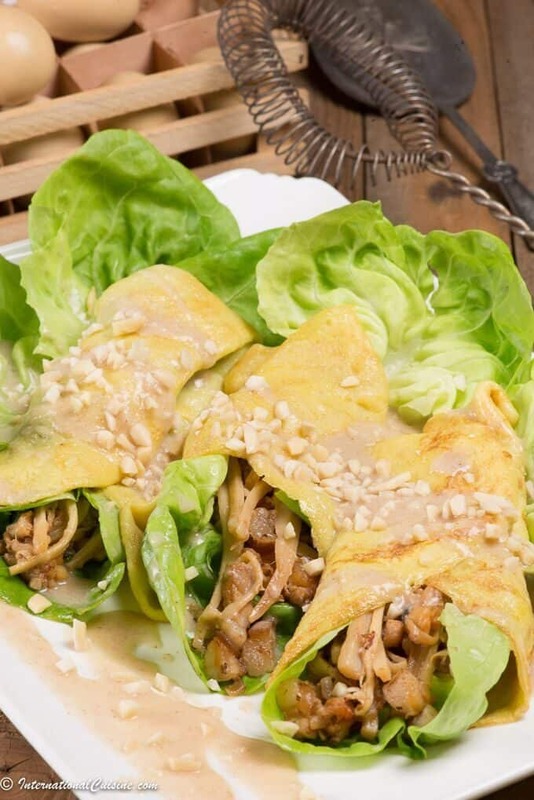 It was made with a light egg crepe and then filled with shrimp, pork and ubod (hearts of palm.) It was topped with a peanut sauce and the result was delicious. For the main course, which was served family style, we had the famous adobo. It was truly the best chicken I have ever had. It was served with rice, which is typically served with every meal in the Philippines. We also enjoyed another beloved dish called pancit bihon. 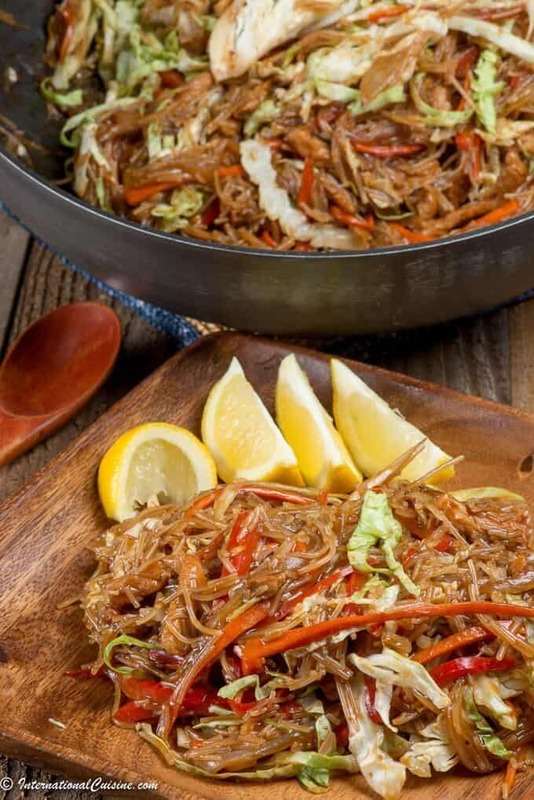 Pancit means “noodle” and was introduced by the Chinese. This rice noodle dish was stir fried with pork and vegetables. It was flavored with soy and fermented fish sauce. This is a quick and easy dish that I plan to make often. For dessert, I just had to make something with that purple yam, called ube. I made a scrumptious ice cream that was as tasty as it was beautiful. After dinner we set up our karaoke machine and sang while enjoying a San Miguel beer which began their operations in the Philippines in 1890. Karaoke is considered the national pastime of Filipinos. I am blessed to have Filipinos as extended family and relish every opportunity to indulge in their exquisite cuisine and family gatherings. Chicken Adonis with rice is my favourite. Balut is a no, no. Thanks for the newsletter updates. Hi Vincent thank you so much for your kind words and I completely agree with you on the balut, no chance!